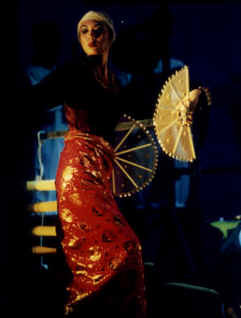 Pagaper depicts a royal manner of "walking" among the Maranao people who live mainly around Lake Lanao. Ladies of the royal court perform this stately dance in preparation for an important event. The ladies gracefully manipulate the Aper (apir) or fan, while emphasizing their small steps, or "kini-kini", which symbolizes their good manners and prominent family background.